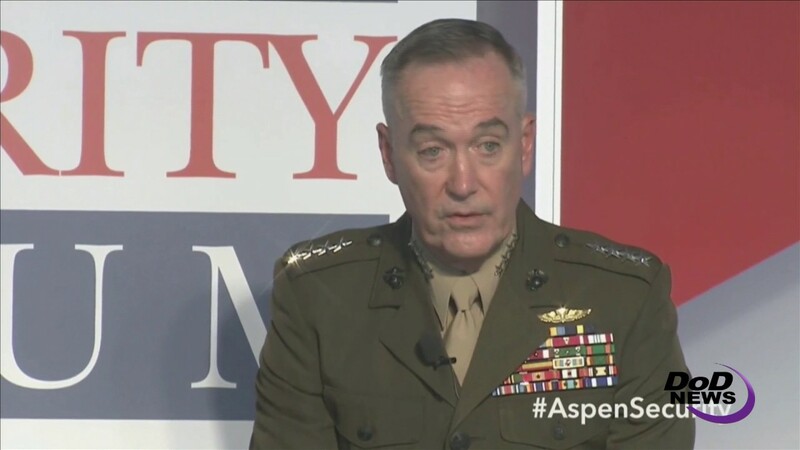 While Russia remains the greatest nation-state threat, the United States doesn’t have the luxury of singling out one challenge, the chairman of the Joint Chiefs of Staff said at the Aspen Security Forum in Aspen, Colorado last night. NBC’s chief foreign affairs correspondent Andrea Mitchell asked Marine Corps Gen. Joe Dunford if he still believed Russia was the biggest threat facing America -- a statement he made two years ago in his confirmation hearings. “From a state actor perspective, it is Russia,” Dunford said. He said this was due to Russia’s military modernization program, its nuclear and cyber capabilities and its actions in Georgia, Crimea and eastern Ukraine. “I would quickly add that we don’t have the luxury today of singling out one challenge,” the chairman said. Dunford believes this is the most volatile time in world affairs since World War II, and Russian actions do not help. “I think from an aggregate capacity and capability perspective, Russia is the most capable state actor we face,” he said. “But we have other challenges -- North Korea, from a sense of urgency perspective, would be our number one challenge. We are certainly dealing with malign challenges from Iran on a daily basis. “Clearly the fight against violent extremism is one that we are completely engaged with, and we have security challenges in the Pacific with a rising China as well,” the chairman continued. The U.S. military must be able to deter nuclear attack from Russia and increase conventional capabilities so Russia is not tempted to challenge the United States and its allies. Dunford noted that maintaining the strength and effectiveness of the NATO alliance is also critically important in deterring Russia’s actions. Indigenous forces -- with help from the coalition to defeat ISIS -- have given the lie to the physical caliphate that ISIS leaders proclaimed. Turkey, an important NATO ally, does not like an armed Kurdish force in Syria, and Dunford noted that he has visited Turkey 12 times in the last year and held further discussions with his colleague in Ankara on a number of other occasions. The Kurds in the SDF are a source of friction with Turkey, he acknowledged, “and we are doing all we can to mitigate their concerns, not only about how we are going after ISIS in Raqqa and the Euphrates River Valley, but the long term relationship we have with Turkey." "I will tell you that any political and military solution in Syria is going to be completed with full recognition of Turkey’s long-term interests are from a security perspective,” the chairman added. Iraqi forces are moving to cement their victory against ISIS in Mosul and have already announced plans to launch campaigns against ISIS in Tal Afar, Huwayjah and Qaim. Dunford expects ISIS will switch to guerilla-type attacks to try to undermine the government. With that in mind, the coalition has established a information-sharing base in the Middle East to exchange information and intelligence. More than 20 countries now participate in the effort, he said. The strategy now is to sever the links connecting ISIS. 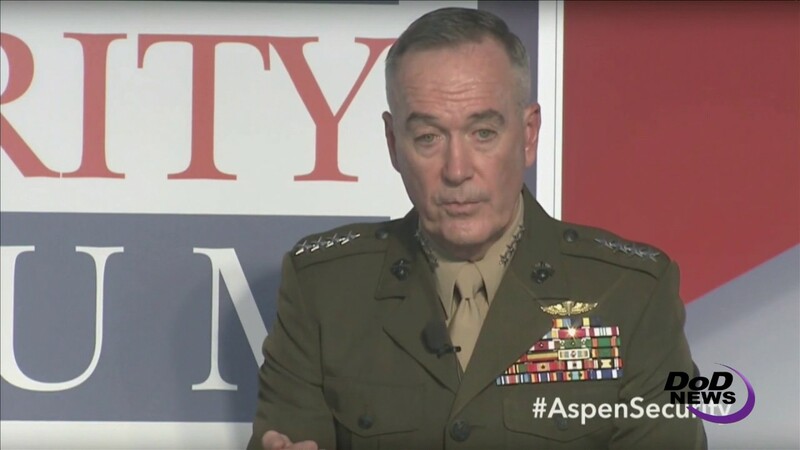 Three things connect these groups: foreign fighters, the flow of resources and money, and the ideology, Dunford said. The strategy is working, the chairman said. As of 15 months ago, more than 1,500 foreign fighters crossed the Turkish border every month. Today, that number is less than 100. Dunford discussed the proposed South Asia strategy as it relates to the American effort in Afghanistan. “I do believe additional forces for the Afghan security forces would make them more competitive,” he said. He noted that when he commanded the International Security Assistance Force in Afghanistan he started with 140,000 troops, who were “on the ground fighting the fight. When I left we had 28,000 U.S. forces on the ground, and today we have 8,700 forces on the ground,” he said. Afghans have taken significant casualties and there are some areas where they need help: most notably in air support, combined arms combat, command and control and intelligence. “Additional forces would help,” he said. He said the reason Defense Secretary Jim Mattis has not made his decision on additional forces for the effort is because he wants to get the greater strategy correct. The strategic framework looks at the area from New Delhi to Teheran with particular attention to Afghanistan and Pakistan, the general said. Dunford praised an Army initiative to create security force assistance brigades, which will be specially equipped to train indigenous forces. He noted that anywhere where the United States has vital national interests -- such as Afghanistan -- there will be an enduring U.S. political, economic and military presence. The size of these presences will shift as conditions change, but they will be present, Dunford said. Placing an artificial timeline on operations is not good for the confidence of the Afghan people, and, he said, it caused hedging behavior in the region as well. “It undermines our cooperation with Pakistan if they don’t believe we will be there long enough to establish security and stability,” the chairman said. The chairman argued that right now, the best approach is through diplomatic and economic realms. He said Secretary of State Rex Tillerson is trying to tighten the noose around North Korea. Economic pressure should cause North Korea to initially freeze and then cap their nuclear weapons program and eventually denuclearize, Dunford said. “Many people have talked about military options [against North Korea] with words like ‘unimaginable,’” he said. “I would shift that slightly to ‘horrific.’ It would be a loss of life unlike any we have experienced in our lifetimes. Anyone who has been alive since World War II has never seen the loss of life that could occur if there is a conflict on the Korean peninsula.